Who made the first ski boots without laces? Henke in 1955, right? Wrong. 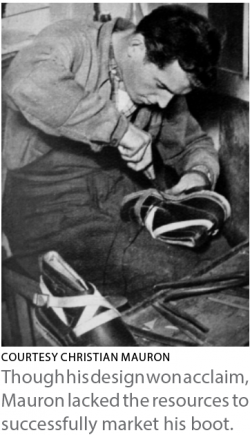 In the postwar years, Joseph Mauron, a 21-year-old Swiss shoemaker, had had it with frozen laces on double-laced boots. He experimented with alternate systems, and settled on a clever design with two buckled straps: the first one fastened down a snow-proof cover (what we would today call the external tongue), and the second held the foot firmly in place and kept the heel down in the boot. That second strap crossed the instep three times and tightened around the Achilles for better purchase on the heel. Introduced in 1948, the Mauron boot that year received the Diplôme de Vermeil medal from the International Leather Bureau in Paris, and the following year a gold medal from the International Leather Organization in London. Mauron lacked the resources to market the boot successfully. He died in 1993.